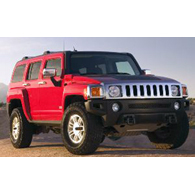 (autoinsidernews) - General Motors announced that HUMMER's sales in North America during the first nine months of 2006 are up 53.5 percent from the same period in 2005. The sales gains are driven solely by the H3, the brand's smallest SUV. As of September, sales of the H2 are down 31.9 percent to 12,562 units, while the H3 has sold 40,381 units, up 120.8 percent. It's quite obvious that the H3 is carrying HUMMER. As people have discovered the H3 for themselves we've seen sales continue to trend upward, explained Martin Walsh, HUMMER general manager. We believe the vehicle's attractive starting price of $29,995, its easy maneuverability and fuel economy comparable to other midsize utilities, is bringing new customers to the brand. While the H3 shouldn't be considered a fuel economy champion (an EPA estimated 15/20 mpg is anything but), it is a much more responsible HUMMER than its big brother, the H2. As sales of truck-based SUVs continue to suffer, the H3 is a bright spot for HUMMER and General Motors, but you would have to be foolish to think that the H3 is immune to the same concerns. HUMMER has been rumored to be considering an even smaller, Jeep Wrangler size vehicle called the H4. Despite declining fuel prices, the shine will eventually wear off the responsible HUMMER, and the brand better have an even more responsible option ready by then, reports Trend.